A Project leader, is a role performed by an assigned, trained individual to lead a project to success. Project Leaders can hold any designation in an organization based on the role they may have to play in the project. A project can be either short term or long term. If the project is short term, we may have a single leader with defined timeline to achieve the goals. When the project is long term, we may need a main project leader ad their back up leaders to ensure a smooth progress in event of a long absence or movement of the leader from the organization for better prospects. Posses people management and motivational skills to manage any or attitude issues of any team members. Should be highly interactive and keep an unbiased attitude towards each team member. Lead the team members to perform their roles efficiently so that the project goals are achieved. Review and give individual feedback to improve the skills of the team members so that performance of the project improves overall. Create a sense of bonding between team members that would result in a team work rather than individual contribution which may not synchronize well with the output of other individual outputs. Open for feedback from team members and convey a positive message to the team members as and when applicable. Clearly measure individual performance and contributions towards the success of the project and ensure a rewarding system that is set to felicitate the achievers. The role of a Project leader may be more than what has been listed above depending on the organizational requirement. Most of the additional roles may be linked with administrative role that is required by other departments (Payroll, transport, HR etc.). 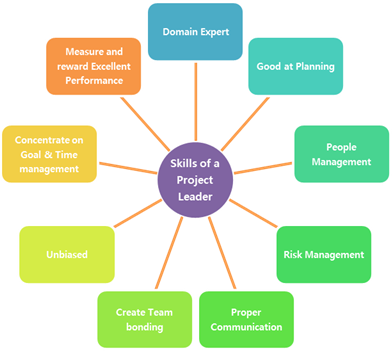 The role of a Six sigma Project leader is also the same or almost similar. The difference we can clearly see is the high degree of people management as the team members would be performing dual roles-one for the Six Sigma project and the main role for their actual project/team. Hence the Six Sigma project leader must align and focus the team member’s contribution towards the goal as the team members may not lace appropriate importance to a short term role. Dual reporting also requires a Six Sigma project leader to constantly keep a good working relationship with the process owners to successfully move on with the project without any obstacles.